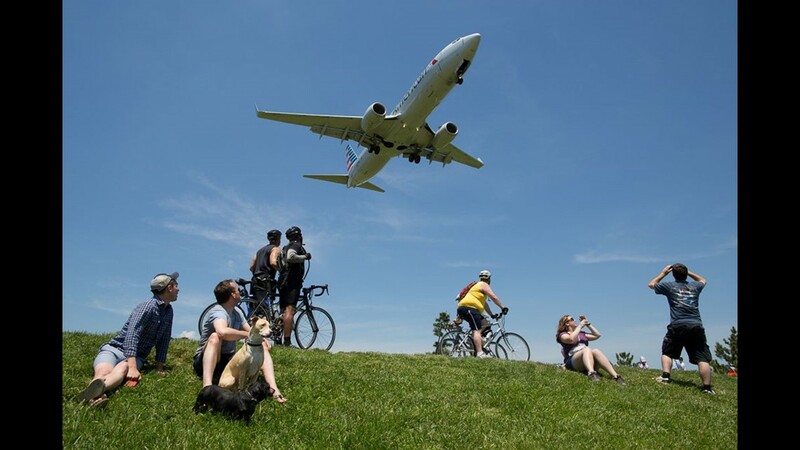 People watch planes at Gravelly Point Park, just north of the runway at Washington DC's Reagan National Airport on May 24, 2015. Kenmore Air's newest seaplane, painted to resemble an orca whale, floats on Seattle's Lake Union on May 3, 2015. Washington DC's Reagan National Airport gleams in the late evening on May 21, 2015. The tail of a privately owned Boeing 747-400 towers over a group of business jets on May 12, 2015. The jets were in town for a secretive meeting known as the Microsoft CEO Summit. The static frame from the Airbus A350 program rests on a ramp at the company's Toulouse, France headquarters in May of 2015. Captain Larry Packer, right, holds up a 53-pound Copper River Salmon with first officer Peter Michels after delivering the fish to Seattle, direct from Cordova Alaska, on May 15, 2015. Moments from landing, an Alaska Airlines Boeing 737-800 casts a deep shadow over a beautiful Alaskan landscape near Cordova, Alaska, on May 14, 2015. A last-generation American Airlines tail is sandwiched inbetween two tails sporting the company's latest branding identity at Washington DC's Reagan National Airport on May 22, 2015. A mostly empty train terminal provides a respite from the hot Phoenix sun on May 8, 2015. A private Boeing 757-200 takes off from Seattle's Boeing Field in May, 2015. Operating for the Department of Justice, a Saab 2000 takes off from Seattle's Boeing Field in May, 2015. Towing a giant trail of jet wash, an Alaska-based Lockheed F-22 rockets out of Seattle on May 12, 2015. An Alaska-based Lockheed F-22 rockets out of Seattle on May 12, 2015. A Boeing company T-33 passenger salutes a gaggle of plane spotters at Seattle's Boeing Field after a test flight in May of 2015. Water kicks up on the runway after a Boeing 737-800 returns to its Boeing Field, Seattle, base on a rainy May day. A Boeing 737 takes off from Seattle's Boeing Field in May, 2015. An Alaska Airlines Boeing 737-400 Combi jet taxies into the terminal as a Korean Air Cargo Boeing 747-400 rolls to a stop on the runway in Anchorage, Alaska on May 14, 2015. An Alaska Airlines Boeing 737-400 Combi awaits a shipment of fresh fish in Cordova, Alaska in the early morning hours of May 15, 2015. An Alaska Airlines Q400 turboprop plane taxies to the gate while another takes off from Seattle, WA on May 21, 2015. An American Airlines Embraer 175 jet prepares to land at Washington DC's Reagonal National Airport on May 24, 2015. A jetBlue Embraer 190 jet prepares to land at Washington DC's Reagonal National Airport on May 24, 2015. A US Airways Embraer regional jet passes over the Washington Monument on May 24, 2015. Condensation forming on the wings briefly obscures part of the wing as an American Airlines Boeing 737-800 lands in Chicago O'Hare on May 24, 2015. A new-build Airbus A350-900 is seen inside the factory in Toulouse, France on May 27, 2015. Airbus A350 tails stick out beyond protective hangars while receiving additional work at the Airbus headquarters outside Toulouse, France on May 28, 2015. A TNT cargo bae-146 jet takes off from Toulouse-Blagnac Airport in France in May of 2015. A Star Air Boeing 767-200 freighter lands in Toulouse-Blagnac Airport in France in May of 2015. Airbus' latest A320neo, powered by CFM Leap engines, rolls down the runway for a test flight from the company's Toulouse-based headquarters in France on May 29, 2015. A Carpatair Fokker 100 jet takes off from Toulouse-Blagnac Airport in France in May of 2015. The small Romanian airline provides service to and from Italy. A KLM Boeing 747-400 in new paint rests at Amsterdam's Schiphol Airport on May 29, 2015. The soft yellowish-gold glow of Washington DC's Reagan National Airport ceiling greets visitors arriving to the nation's capitol in May of 2015. C-3PO and R2-D2 pass by the engine of a Boeing 787 Dreamliner while welcoming a Star Wars-themed jet to ANA's fleet on September 12, 2015. A brand-new Cargolux Boeing 747-8 cargo jet takes off from Paine Field in Everett, Wash. on September 13, 2015 for a test flight. A rare Boeing 727, operating a sports charter for a Major League baseball team, takes off from Boeing Field in Seattle, Wash. in September of 2015. A Delta Air Lines Boeing 767-300 taxies into the gate on a rainy afternoon in December, 2014. Heading out for a test flight, an Avianca Cargo Airbus A330 Freighter is towed to position via a tug at Airbus headquarters in Toulouse, France in December, 2014. With its distinctive architecture, Doha's Hamad International Airport is a buzz activity despite the 3AM local hour in December of 2014. An Emirates Airbus A380 superjumbo taxies to the gate after landing in Houston, Texas in December, 2014. An American Airlines Boeing 737-800 departs Phoenix Sky Harbor in January of 2015. Cessna's trade places on a taxiway at Paine Field in Everett, WA in February of 2015. F-18 Growler fighter jets practice carrier landings at a remote landing strip on Whidbey Island in Washington State in March of 2015. ANA's R2-D2-themed Boeing 787 Dreamliner after it emerged from a Boeing hangar in Everett, Wash., on Sept. 12, 2015. An unfinished nose of a 777-300, seen during a tour of Boeing's Everett, WA widebody jet factory on June 1, 2015. Workers attach slats onto a 737 passenger jet wing at the Boeing Renton factory in June of 2015. A rain storm gathers steam nearby as an American Eagle commuter jet prepares to leave Roswell, NM for Dallas, TX on August 5, 2015. A United Express Embraer jet taxies into the gate at Dallas Ft. Worth International Airport in August of 2015. The Airbus flightline is seen from a departing flight out of Toulouse-Blagnac Airport, in France, in May of 2015. An American Airlines MD-80 'Mad Dog' jet taxies out for take off from Dallas Ft. Worth International Airport in August of 2015. Pilots check for other airplanes before turning onto the runway at Boeing Field in Seattle, Wash. on September 13, 2015. A Boeing KC-135 aerial refueling jet based at Fairchild Air Force Base near Spokane, Wash, takes off from Boeing Field in Seattle, Wash. on September 13, 2015. A Delta Connection Bombardier CRJ-700 lands at dusk at Seattle-Tacoma International Airport in September of 2015. An Alaska Airlines Boeing 737 lands at dusk at Seattle-Tacoma International Airport in September of 2015 as Mt. Rainier looms. A United Express Boeing 737 jet taxies into the gate at Dallas Ft. Worth International Airport in August of 2015. An Alaska Airlines Embraer E170 jet lands at night at Seattle-Tacoma International Airport in September of 2015. An Alaska Airlines Boeing 737 lands at Seattle-Tacoma International Airport in September of 2015. A United Airlines Boeing 767-400 rushes by the Seattle-Tacoma International Airport tower in September of 2015. An Air Canada Express Dash-8 plane lands at Seattle-Tacoma International Airport in September of 2015.